Looking for a quick overview of our company—and why SparkPost is the fastest-growing email delivery service? Do you need an easy way to share information about SparkPost with your colleagues? 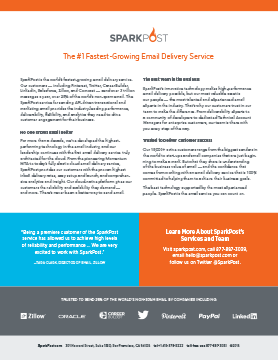 This one-page brief describes SparkPost in a nutshell: who we are, about our vision for email delivery, and why we’re trusted to deliver customer success.